When BC Place Stadium intially opened in 1983, Vancouver Whitecaps of the North American Soccer League played the first sporting event in the stadium, against North West rivals Seattle Sounders. 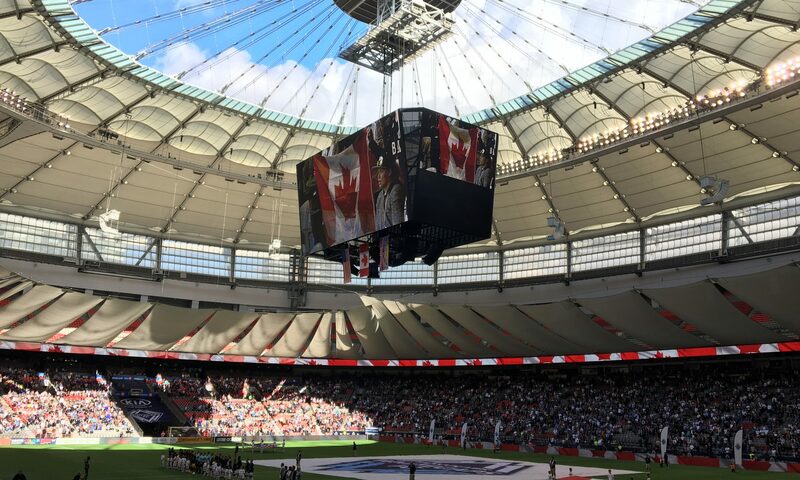 Following the Friday grand opening BC Lions game, Sunday afternoon saw the current MLS Whitecaps FC make their debut at the newly renovated BC Place Stadium. Whitecaps put on a great opening show for the sell out crowd of 21,000 fans. The normally cavernous stadiums upper bowl was hidden behind a row of cable suspended sails, creating an intimate setting for an afternoon of football. The addition of soccer specific seating brought the fans closer to the action as additional seating brought the seats right down to pitch level on the west end and south sides of the stands. The exciting pre-game show featured the usual drumming in of the players, anthem singing, flags and fireworks. A contingent of junior players lined the field and kicked dozens of comemorative balls into the stands and boosted the fans in anticipation of the game ahead. The pre-game also included 15 year old Branden Tomash scoring the ceremonial first goal on the Bell Pitch at BC Place. Unfortunately, this was the only goal the local fans would celebrate as the Timbers beat the ‘Caps 1-nil.